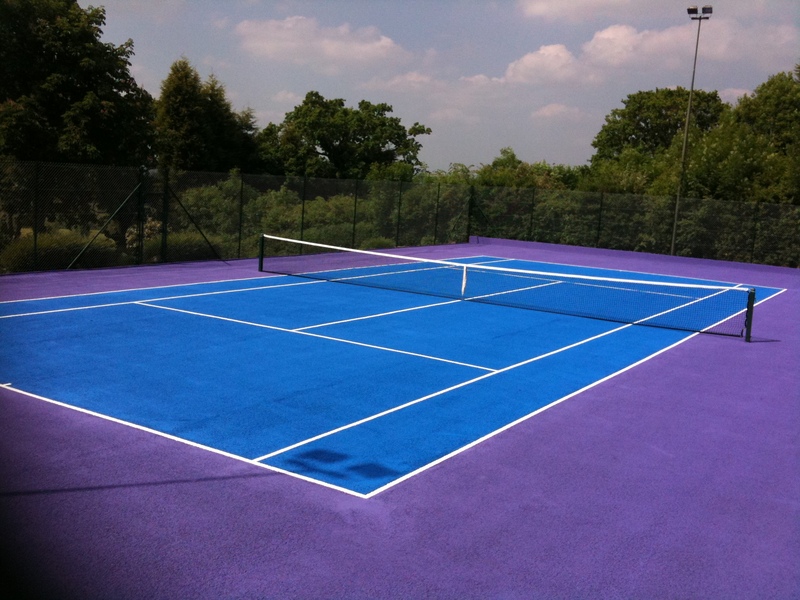 Tennis court surfacing can be installed in the UK in a number of different sport surface materials including polymeric and porous macadam. 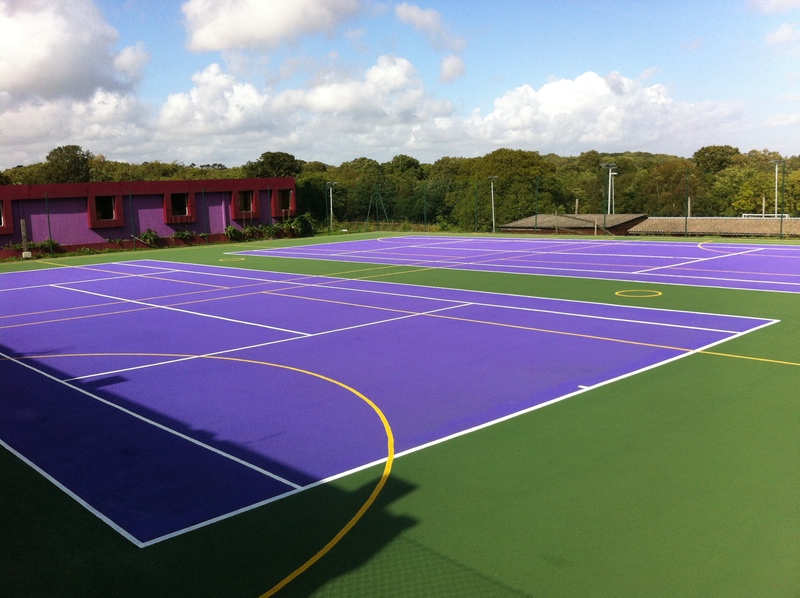 These tennis facilities are constructed by specialist sports surfacing contractors at a range of organisations such as sports clubs, schools and universities. 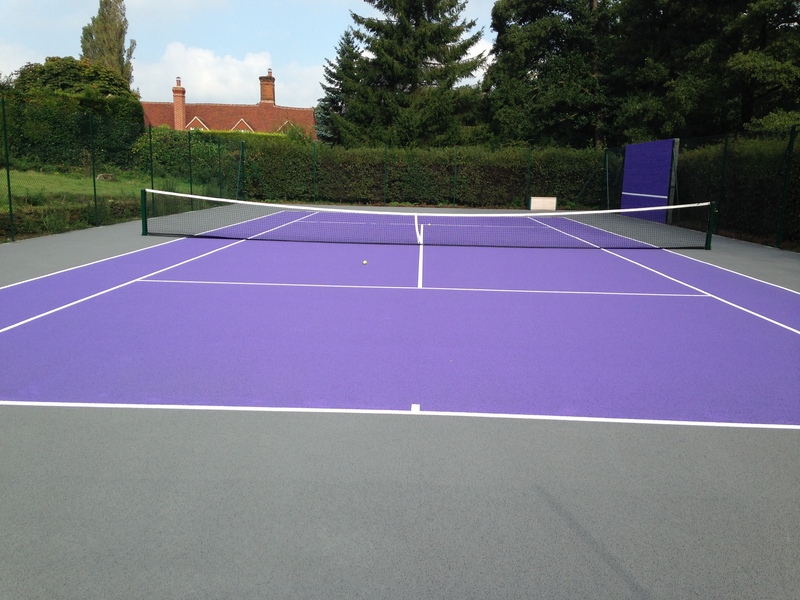 Macadam Tennis Surfacing – This surface is made from a tarmac layer that is then covered with an aggregate rich paint coating that fulfils the criteria set by LTA and ITF regarding slip resistance, ensuring safety for the players. 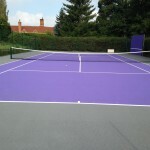 Polymeric Tennis Court Surface – Polymeric surfacing is made from an EPDM rubber crumb which is ideal for UK facilities due to the excellent performance characteristics and also the high slip resistance the two layers of polyurethane paint offers. Sand Filled Tennis Facilities – This specification is also completely porous, and gives off the effect of playing on natural grass. This surface is perfect for tennis courts incorporated into MUGAs (multi use games areas) as it is suitable for both football and hockey use as well. Artificial Clay Tennis Courts Surface – Artificial clay is just as suitable for tennis as natural clay is, it also gives off the same professional feel. This specification is completely porous and along with the other options, fulfils the criteria for the LTA and ITF slip resistance standards. 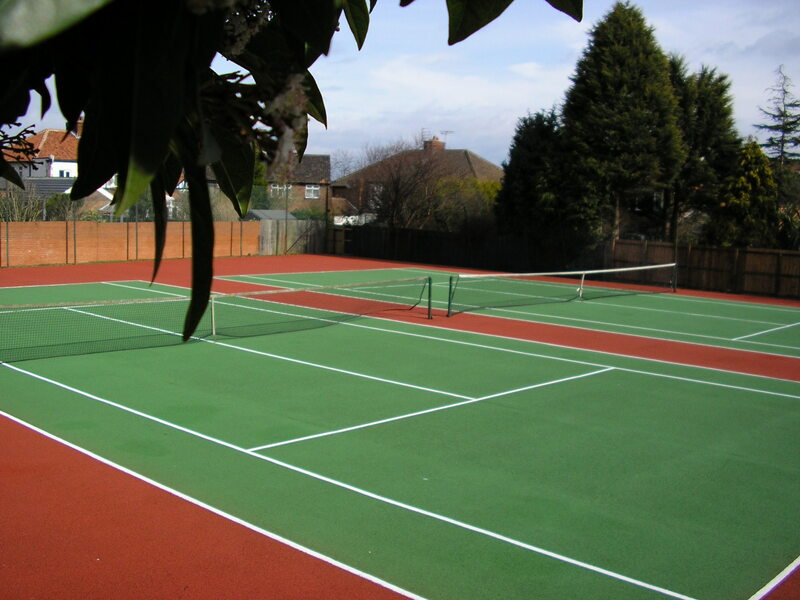 The advantage of artificial clay courts over natural clay is that the synthetic surfacing requires much less maintenance and can be used in all weather conditions. Where real clay becomes flooded in wet weather, synthetic clay courts allow the rainwater to soak through instead of pooling on the surface. It’s important to make sure that the contractor you select to carry out the UK tennis court surfacing has the relevant and required accreditations and certificates and it’s important to conduct a credit check to make sure you get the quality job you deserve. 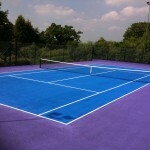 The price of each tennis courts surface depends on your chosen design specification for the tennis court In question. Which means there are plenty of ways to make sure you can stick within your budget and reduce the tennis court surface costs for your institution. 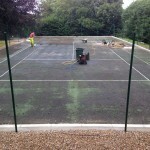 The main factor for the tennis courts surface costs is the size and dimensions you wish your court to be. Obviously the larger the court the more expensive it will be. This gives you more freedom to alter the price, allowing you to stretch your budget further and invest in other potential features for your facility such as rebound fencing; which can also be altered in height and the particular fencing you require. To create an accurate formal price quote for you we have to gather the important required information before we can tailor the quote to fit within your budget and keep the price of the job down to a minimum. 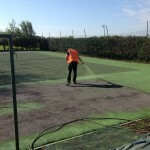 We can also offer services to maintain your tennis court so that it keeps its top performance qualities all year round. Looking after the surface properly will help you prevent the court from getting damaged and needing repairs in the future. This video below shows a project we completed at a school in Macclesfield which wanted to replace a natural grass area with a new macadam tennis surface. Our installers carried out the full work including excavating the existing grass, preparing the groundworks, installing a porous stone sub base and laying the macadam surfacing. We then applied an anti slip acrylic paint coating in green, along with multi use line markings in yellow and white. This macadam sports facility system is completely porous meaning it can be used in all weather conditions and water is able to quickly drain away without getting built up on the surface. This is ideal for school facilities as it means they are usable all year round and won’t become flooded in wet weather. 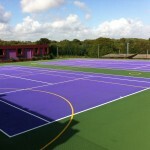 Our team of experts have completed many similar projects in the UK at schools and sports clubs. Each project is totally different and it all depends on the type of facility that is required. 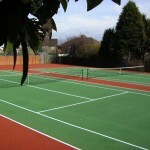 Different surfaces are available to suit both professional playing standards and recreational practise areas. Just let us know if you’re looking for a specific design and we’ll do what we can to create this for you. 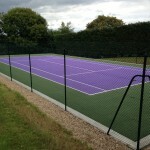 We can offer advice on a range of services for outdoor tennis facilities and multi use games areas in the UK. Please fill out the contact form or send us an e-mail over, and we’ll get back to you as soon as possible to discuss your enquiry. We will then be able to tailor a proposal for you and hopefully start building your new sport facility. 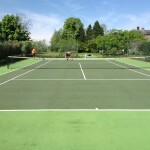 Feel free to get in touch with us if you have any questions with regards to the different types of tennis court surfacing and which one would be best for your project. The costs can vary but we’ll do our best to stick to your budget and make the work as affordable as possible.